I can’t seem to find any literature that addresses the question of how (outward) external rotation at the hip affects which muscles are active during abduction. It would seem that external rotation, especially the extreme external rotation in ballet, reduces the ability of the TFL to work on the hip, so that taking the leg a la second is more like hip flexion - mostly by Psoas Major but assisted by the TFL - than the typical abduction that PE and athletic-training-oriented models are familiar with. What are your thoughts on this? Yes, you are correct in the fact that there is very little literature that actually shows the correct way of working the hip in a devéloppé a la seconde. It is something that a lot of people struggle with and the mechanics of the hip do change quite a bit when it is in external rotation. Also, if the leg is fully externally rotated the effect of the deep external rotators (the turnout muscles) changes above 90 degrees. this means that a lot of the information on functional anatomy that is written in anatomy books doesn’t help us as dancers. I go into the functional anatomy and mechanics of the hip in detail in our Training Turnout Program and in my 3 day Dance Teacher Training Workshop. Every dancers’ hip is also slightly different so the optimal strategy for each dancer will vary slightly depending on their natural range of motion in the actual hip socket and also in the ligaments that surround the joint. In most PE/Athletic training models, they do report that TFL and Gluteus Medius abduct the leg (take it up to the side). These two muscles will bring the working leg up in parallel and this is not what we want aesthetically or functionally as a dancer. A lot of people actually damage their hips by over using these muscles in an attempt to get try and get their leg up in seconde. In actual fact, the deep external rotators need to control the position of the hip in the socket. As the leg is taken up the dancer actually needs to relax the TFL a little and the load is progressively is taken up by the deep hip flexor Psoas Major, and some side flexion is supported by the external obliques. 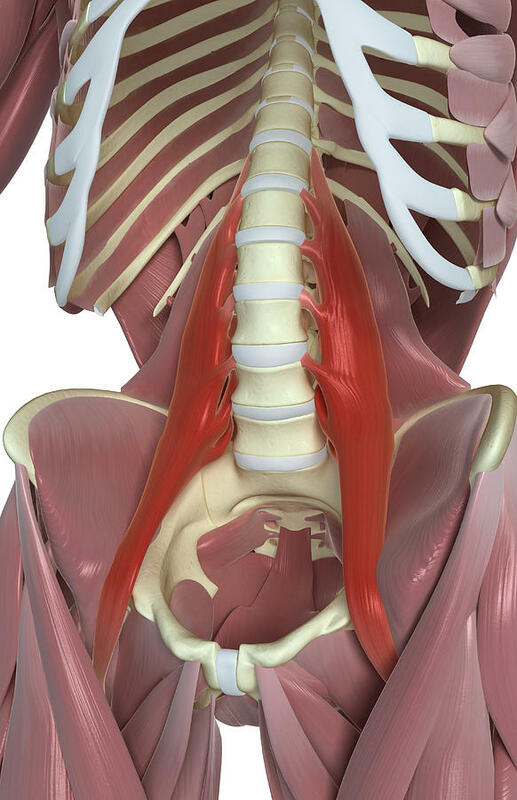 However, this is assuming that the Psoas is available as a hip flexor. Interestingly a lot of people struggle taking their leg in second and get very tight through the front because Psoas is not available to be used. If the deep spinal stabilizing muscles of the lower back (Mutifidus) are not working well, Psoas Major will tend to grip on from the front to help stabilize the spine. If this muscle is already being used to stabilize the spine, it is obviously less available to lift the leg. This is why a lot of the load gets taken in the front of the thigh (Rectus Femoris) and the top of the hip (TFL) resulting in pain, inflammation and clicking in the hips. For more information on this please see our article on Chronic Hip Pain. Therefore, if you are trying to work with someone who is struggling to get their leg up into second, I would actually suggest having a look at what is going on with the deep stabilisers of the lower back. When I work with teachers we focus a lot on developing appropriate control of the deepest layers of core and the deep lower back and oblique control and then re-patterning the hip on top of that base. The other thing to check is to make sure that the dancer actually has the appropriate range of motion in their hip to support the positions that they are trying to take their leg into. This sounds obvious, however a lot of people are trying to hold their leg in a position where it cannot actually go passively. So, in order to place the leg correctly in a devéloppé a la seconde we need to work on the passive range of the hip, the control of the deep external rotators, relaxation of the superficial abductors and control of the Psoas Major and Iliacus, deep back control and oblique strength to hold it in that position. I prefer to work on each of these in isolation and then re-build the movement once this has all been established. This is very similar to all of the factors involved in carrying the leg devant, as demonstrated below.